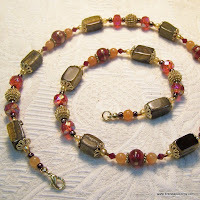 My colorful handmade necklaces come in quite a variety of styles and colors. I use both new and vintage glass and crystal beads, along with semi-precious stones like jasper, quartz, jade, carnelian, turquoise, fresh-water pearls...and lots more. My jewelry is known for the vivid color combinations and unique patterns. Browse through my selection below, or contact me for a custom order. Click on an image below for details on each item.